If you’re like me, you probably store a lot of sensitive information in the cloud. A long time ago in a galaxy far far away, all it took was a very strong password to keep your various accounts safe online. Those days appear to be over though with the recent security scares, leaks, and breaches that have peppered the headlines over the last year or so. One very effective way to protect your online accounts from being hacked is using two-step verification. Dropbox is the latest online service to offer this option to protect its users from hackers and security threats. 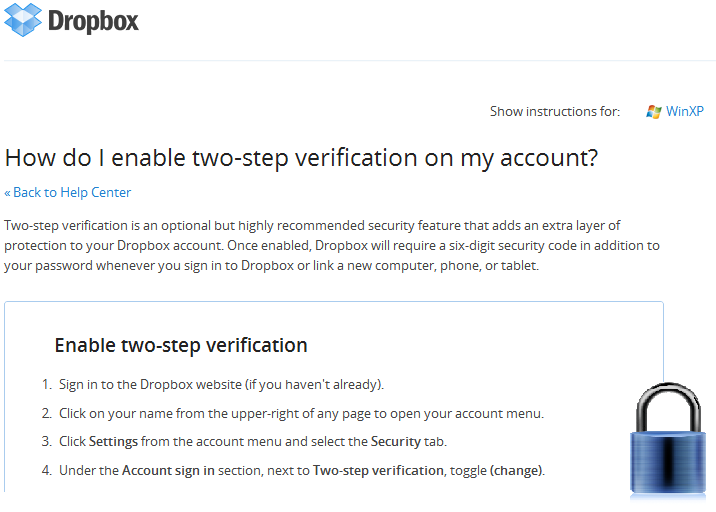 Two-step verification is exactly what it sounds like. In addition to the traditional username/password login, you are required to input a pin acquired via SMS or secure mobile app to sign into your Dropbox account online or sync your files to a new device. To enable this on your Dropbox account, simply login on the Dropbox website, click your username, click “security”, and under the “account sign-in” section click change on the “two step verification” option. You’ll be asked if you’d like to authenticate via sms or authentication app on your smartphone. The whole process takes less than a minute and could safe you a lot of hassle down the road. Do any of you use two-step verification on other online services? If so, which ones?